Create mobile real-world MMO experiences on Android and iOS, with a particular emphasis on cross-platform native development in C++. Experience with platform level sensor, video and background services frameworks in either Java on Android, Objective-C on iOS, or shader pipelines in GLSL are also highly desired. Applicants with experience in native mobile application development, mobile or ARM-based device driver, kernel or graphics integration or GPU pipeline design or compilation are particularly invited to apply but other backgrounds may also be applicable. You will work with a proven and experienced team of mobile and cloud developers to turn the entire world into a gameboard. Looking for a new place to call home and build cool games? 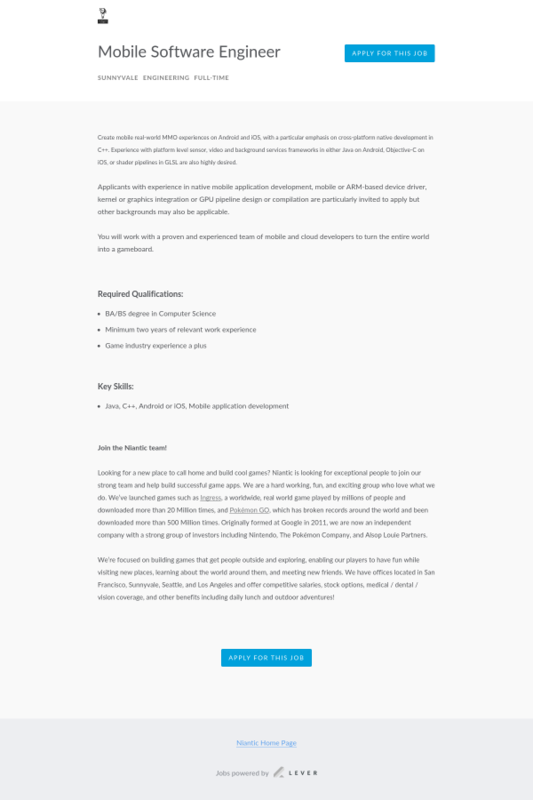 Niantic is looking for exceptional people to join our strong team and help build successful game apps. We are a hard working, fun, and exciting group who love what we do. We’ve launched games such as Ingress, a worldwide, real world game played by millions of people and downloaded more than 20 Million times, and Pokémon GO, which has broken records around the world and been downloaded more than 500 Million times. Originally formed at Google in 2011, we are now an independent company with a strong group of investors including Nintendo, The Pokémon Company, and Alsop Louie Partners. We’re focused on building games that get people outside and exploring, enabling our players to have fun while visiting new places, learning about the world around them, and meeting new friends. We have offices located in San Francisco, Sunnyvale, Seattle, and Los Angeles and offer competitive salaries, stock options, medical / dental / vision coverage, and other benefits including daily lunch and outdoor adventures!